“Extraordinary”- Exceptional Renovated Builder’s Home that has taken an One Level Home & Created a Great Open Floor Plan for Today’s Living with approx. 6,600 sqft. The Millwork & Craftsmanship is to Die For! Very Comfortable & Elegantly Appointed with Exquisite Heavy Millwork, Soaring 9’ & 10’ Ceilings, Tons of Custom Built-Ins, Rich Red Oak Floors & New Insulated Windows.Rare Private 1st. Floor Master Wing with Stunning Bath+ 3 Additional Bedrooms on the 1st. with En-suite Baths, Spectacular Front Entry Vestibule with Rear Staircase & Palladium Window, Open Kitchen & FR.Arrangement with Gorgeous Stone Fireplace & Entertainment Center, A Truly Amazing Kitchen Layout with The Finest Custom Cherry Cabinetry/Granite with All the “Whistles and Bells” for that “True Chef”, 2nd. Floor features 2 More Huge Bedrooms + 2 Luxury Full Baths, Walk-In Closets, Wonderful Kid’s Game Room/Sitting Room + Kitchenette & Private Home Office with Vaulted Ceilings & Separate Rear Staircase: :3 Gas Furnaces/Heat Pump, French Doors to Roof Top Deck w/ Gas FRPL. Back Yard Terrace & Wonderful Detached Workshop/Studio, No Exterior Maintenance, Rinnia Water Heater,2(200 Amp)+ Security, Truly a Wow Factor! 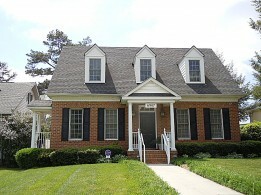 The Gentil Company has successfully provided real estate services to Richmonders for over 37 years. Our agents have represented many of Richmond's top professionals and executives. Our list of references is truly a who's who of Richmond. Long respected for their expertise and professionalism, the agents of The Gentil Company are all serious, full-time professionals whose sole mission is to simply be the best at what they do, thereby enhancing their client's interests. Given today's fluid and constantly changing conditions, good advice is essential in order for buyers and sellers to maximize their investment. Perhaps that's why over 90% of our clients are former clients or referrals from former clients. We give good advice and we get great results. Our business model is simple; associate with knowledgeable, experienced professionals who understand that this is their career, not their job. It works. We've been around a long time.